Warfare History Network’s The Battle of Gettysburg sheds new light on the definitive battle of the Civil War. Yes! I’d like to buy The Battle of Gettysburg! 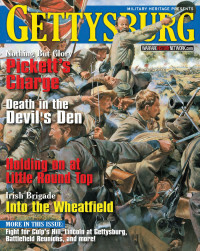 These and every other imaginable detail of this most iconic of Civil War battles, from start to finish, are all here in Warfare History Network’s comprehensive Special Issue, The Battle of Gettysburg. You’ll never think about Gettysburg the same way again. Of all the memorable battles of the Civil War, it is perhaps Gettysburg that captures our imagination the most. Not only was it the largest battle fought in Union territory—it’s often described as the turning point in the entire war. After the onslaught of battles and minor skirmishes, Lee’s attempt to invade Northern territory was over. Yet there are so many stories behind the Battle of Gettysburg that it sometimes seems to defy our efforts to wrap our brains around it. That’s why Warfare History Network has compiled this in-depth special issue, a 96-page guidebook full of crucial details that define Gettysburg as an iconic American moment. When you read this special report, you start your journey in the bucolic village itself in late June 1863 … when Civil War battles on northern soil were practically unheard of. You’ll imagine yourself one of the citizenry, stunned to find yourself surrounded by Colonel Elijah White’s “Comanches” and frantically trying to hide your horses from the marauders. You’ll practically feel the fear and sense of dread that the townsfolk experienced on June 30 … then, suddenly, you’ll find yourself in the midst of the onslaught, dealing with the carnage that this most terrible of Civil War battles had wrought. 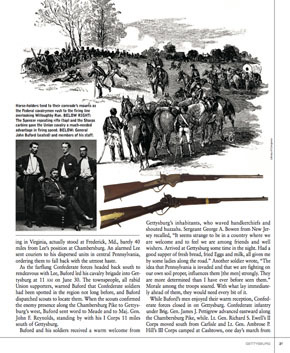 This kind of personal, intimate telling of the Battle of Gettysburg is what makes this Special Report stand out in a crowd of imitators … and it’s from the Warfare History Network, home of the foremost authorities on the Civil War, WWII and the entire history of warfare. This is no dry recitation of facts, no routine tactical manual. 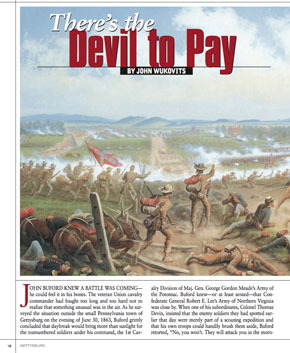 This report is full of bullets hissing, soldiers advancing and retreating, dead bodies covering the ground for a square mile, and General John Buford shouting “There’s the devil to pay!” as the Federals launched themselves at Confederate troops. General Hancock and General Armistead: Fact or Fairytale? The Battle of Gettysburg also digs deep into controversial tales of this most famous Civil War battleground. Consider the apocryphal story of Lewis Armistead and Winfield Scott Hancock, allegedly the greatest of friends who were both at the Battle of Gettysburg on opposite sides of the field. While many historians dismiss the romantic tale of a long and deep friendship between General Hancock and General Armistead, culminating in Armistead passing his personal possessions to Hancock as he lay dying on the battlefield, this special report presents all the evidence, allowing the reader to draw his own conclusions. All of these people come to life in their own words, the skilled writing of our experts on battles of the Civil War, and the Civil War pictures you demand in a report like this. When you read The Battle of Gettysburg, you’ll understand the fear, the bravery and the pain that the soldiers experienced, and ponder the questions that historians have yet to answer about these ferocious battles. Why did General Robert E. Lee agree with J.E.B. 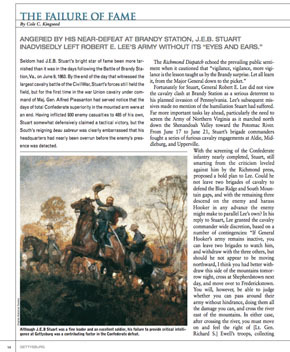 Stuart’s rash plan to conduct a raid deep in enemy territory – causing Stuart to arrive at Gettysburg too late to assist in the Confederate attack? What caused Rebel artillery to suddenly become wildly inaccurate at a crucial point in the battle for Cemetery Ridge? And who actually won the terrible, see-saw battle for Devil’s Den, where “the crash of iron and lead against the granite rocks and the concussion of sound from rifle and artillery blasts further added to the terror”? Every word of this special issue puts you in the heart of the battle. You’ll be inside Gettysburg as never before in these skillfully written tales of famous battles of the Civil War. You’ll join the Blue and the Gray as they fight their war across the smoky fields and woods … you’ll be there with Pickett’s men as they charge hopelessly up Cemetery Ridge … you’ll feel the awesome silence as the men of the Irish Brigade kneel to accept Absolution to prepare for battle in the deadly Wheatfield. Of course, no study of the Battle of Gettysburg would be complete without an inside look at how Abraham Lincoln came to accept the invitation to speak, and write the 272-word speech that has become as famous as the battle itself. And the Civil War pictures we include in this special report show troops marching to the Gettysburg dedication ceremony, while women in hoop skirts and shawls watch their approach; and onlookers assembling with the iconic cemetery gates looming in the background, just months after the some of the war’s bloodiest fighting had swirled around them. And don’t overlook our report on the 50th anniversary celebration, complete with a re-creation of Pickett’s Charge, a great deal of cordial hand-shaking, and a slight misunderstanding at dinner that ended with several vets going at each other … with forks. Finally, The Battle of Gettysburg ends with a comprehensive guide to touring this peaceful, well-preserved spot. Naturally, the experts at Warfare History Network are so familiar with the battlefield, they could guide you with their eyes closed, and this chapter alone is worth the price of this special report! Above all, you’ll be astonished at the new details you’ll learn about this most terrible of Civil War battles, and gain a new appreciation of the facts you already know. Buy it right now – though instead of urging you to read it immediately, as I would for a shorter, less detailed briefing, I suggest you plan a fair amount of free time to devote to it, because you won’t want to put it down once you start! In fact, there’s so much detail in this report, you’ll find yourself going back to it again and again to dig out information you may have missed the first time around. Meanwhile, I’m sure you’ll enjoy reading it as much as we’ve enjoyed writing it! PSS: Artists both contemporary and modern have created some stunning Civil War pictures for your enjoyment in this special issue. Buy it now and dig in! Add a Comment Already Subscribe?